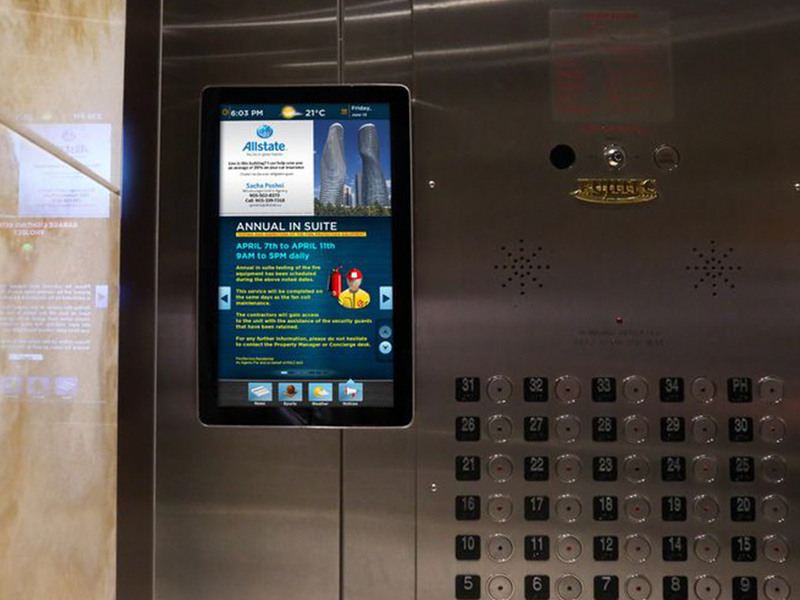 The Residential Network gets advertisers past the locked door of lobbies and enables them to display their ads alongside timely, around-the-clock building-specific information, local weather, and news. The insight? Good things happen when you adapt your messaging to fit into your audience’s daily schedule. The respectful familiarity that exists among like-minded tenants, coupled with the safe environment of the place they call home, makes residential buildings a great place to achieve meaningful brand integration. Our screens are strategically placed in the heavy-traffic common areas of high-rise buildings to enhance the resident experience. Why choose the Residential Building Environment? Advertising in an environment where there’s a strong sense of community can be quite effective for a company. Whether you’re looking to promote a small local business or make a local impact as a global brand, you’ll get a massive head start by reaching consumers during their daily routines. Not to mention that you can get downright specific in your targeting. Beyond their home address, you can select your audience based on their household income, education level, or primary occupation. Close to one hundred percent of the people who see your advertising will be locals or people looking to live like a local for some time (think Airbnb and such). Not only does it make sense for business next door to advertise its products or services, it’s a great opportunity to develop new habits among customers. Want to speak to the newcomers to the neighborhood? The Residential Building network’s a great place to introduce them to your business and let them know where to look for you. The Digital Residential Network cuts through the clutter of traditional media vehicles—flyers, newspapers, direct mail, and such—at a fraction of the cost. Advertisers can easily update their creative in real time without the hassle of reprinting and redistributing an ad. 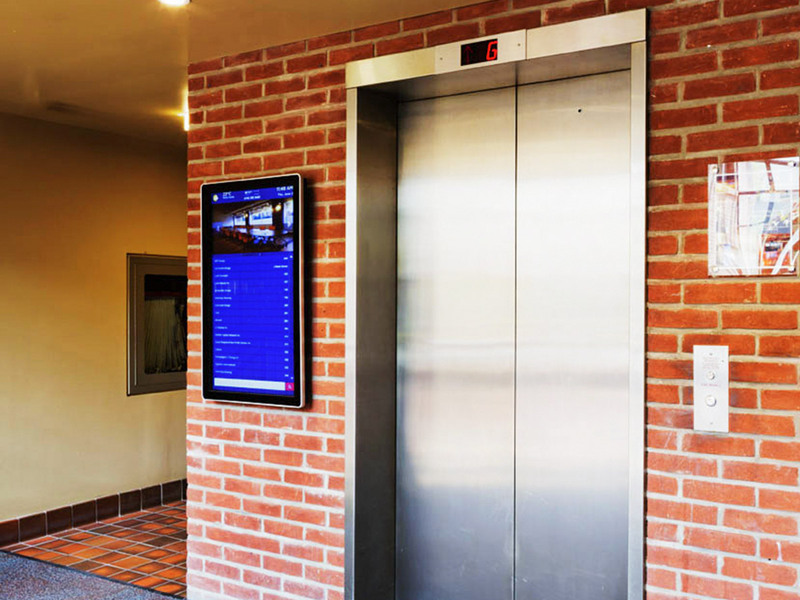 The screens provide added value to tenants by allowing them to catch up on news, local weather, and building announcements. Your brand can be a part of that added value, perhaps more importantly, associated with added value. 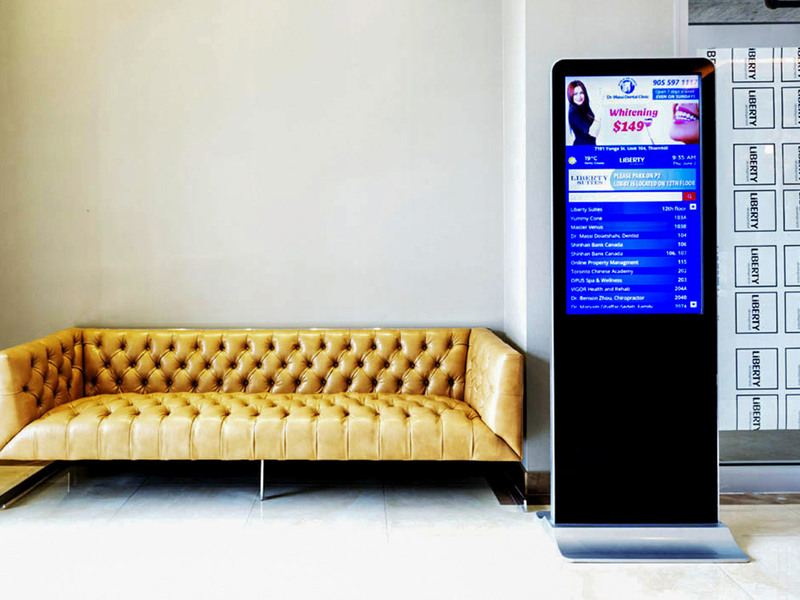 Digital signage is a very effective way to harness an audience’s attention while making the atmosphere livelier. In any environment, being able to command attention to content is valuable; in the residential building, it’s all the more valuable, as there are no other sources of advertising or entertainment in the area. Not only does that help to create a more engaging experience, it also allows for a more subtle approach because you’re not competing with a loud environment. Although different ads have different needs, there are certain principles and guidelines should always be observed. The following examples represent industry benchmarks for the most current, innovative, and effective practices in digital out-of-home. Humour, high-contrast colour, and an easy solution: Just Eat hits the ball out of the park with this simple creative. After a long day at work, consumers are looking for easy-going and simple—and that’s exactly what’s suggested here. Download the app, order, kick back, and wait peacefully in the comfort of your own home. That’s what we call great delivery. Shomi decided to promote its streaming services by using a popular TV show. That seems straightforward enough, but it didn’t end there. They combined provocative copy with powerful pictures, not to mention a clever ending (hacking manoeuvers, anyone? ), to make their ad seriously attention-grabbing. You can bank on this ad leading to more than a few Google searches. Ever heard us ramble on and on about emphasizing the local offer? This is a perfect example. These deals are not only right around the corner, they’re valid now. Shopper’s Drug Mart did well to diversify its call to action to a few different types of consumers by featuring beauty products, health supplements, and beverages. Quick, efficient, and covered in bold colours. That’s a winning formula. Office towers are prime, premium settings in which to find an extremely precise and desirable audience: business professionals. So for advertisers, digital screens in office towers are the perfect platform for delivering their message alongside breaking news, local weather, and building content. Place-based corporate networks, often viewed as a symbol of the high-end commercial environment, engage the business crowd in those rare moments of their day when they’re forced to wait: lobbies and elevators.